You will be warmly welcomed at 'La Maison Rose', situated in a small village just north of the spectacular Pyrénéan mountain chain, just south of the Madiran and St Mont vineyards, and a day trip out to the Atlantic beaches or Spain. This attractive house easily sleeps 10, but its layout is such that a couple would not feel it too big as it is a 'house of two halves', with two staircases to the first floor either end of the house, the upstairs being divided in effect by one of the bathrooms. It is set in lovely gardens, with lots of shade trees, a 10m x 5m pool with roman steps and removable security cover, a barbeque area, and a large space for ball games, plus a huge trampoline and other outdoor games to entertain you. It is close to the top ski resorts in the French Pyrénées, La Mongie/Tourmalet, and in an area abounding with great shopping, restaurants, wine tastings - try the Madiran, with its health giving qualities, or the St Mont as a lighter table wine - come and enjoy! My name is Marion and I live in London with my husband Simon and two children. 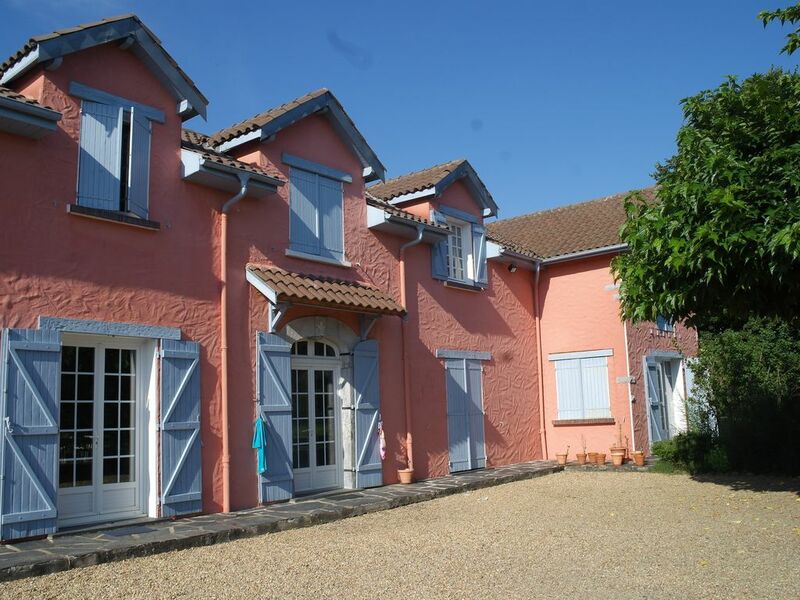 La Maison Rose is a tranquil bolt hole which we enjoy as often as we can. In the photograph above, I have been picking plums which I store in rum to enjoy at Christmas and also make into chutney. For some years our family holidays had been spent looking for a holiday home. We wanted somewhere near mountains so we could use it for skiing in the winter and somewhere warm enough, with a pool to be a great location for summer holidays. We also wanted a house big enough to accommodate friends and family. We didn't know this area of France at all, it felt 'undiscovered' and totally French. Marsac itself is a very small farming village. The only sounds are the church bells, cockerels in the morning, the occasional tractor, and the jingle of the van from the bakery in the next village on it's delivery round. However, drive south for ten minutes and there's E Leclerc supermarket and a further 5 minutes and you're in the bustling market town of Tarbes. I love the contrast between our busy London life and the peace of La Maison Rose. It may take a day or two, but everyone in the family relaxes and we enjoy quality time with each other. The Atlantic surfing beaches, Biarritz and the charming St. Jean de Luz are only a couple of hours away and well worth a day trip. The Pyrenees provide a spectacular view whatever the season! The largest ski resort in the Pyrenees, La Mongie, is an hour's drive. Walks, waterfalls and picnic places in the summer. Madiran wine from the gentle Madiran hills just north of La Maison Rose. As much as we enjoy days out, I love the fact that there's plenty to do (or not!) without leaving the property including table tennis, trampoline and salt water swimming pool (gentle on sensitive skin). En suite bathroom to bedroom 1 with bath/shower over, wc, wash basin. Shower room mid first floor. Separate wc on first floor. Large shower cubicle in utility room on ground floor. Separate wc on ground floor. All beds made up with fresh sheets and duvets. In summer, washing hung out on the line but tumble dryer in the utility room. Large log burning fire place in main lounge. Indoor and outdoor towels provided. Wood burner in table tennis room. Living room/dining room with refectory table and oak benches, fall into the squishy sofas, set around an open wood fire, TV, DVD. French doors open to the gardens to the south and north. Quietly peruse brochures in the cane seating in the library. Cooker, hob, fridge/freezer, dishwasher, microwave, electric kettle and coffee machine. A large table in the lounge with bench seating and chairs. Tables and chairs outside for summer al fresco dining. And a large selection of films. Varied selection, information about the area and easy reading left by previous guests. A large private garden. Apart from the area around the private pool, there are lawned areas in full sunlight or in the shade of well established trees. Move the hammock on the frame to desired spot! Your owners bought this house in order to be close the the ski slopes at La Mongie, Bareges, Tourmalet. Bareges is an easy drive - an hour and you are on the slopes! La Mongie is a little bit longer to get to, but still a good morning or afternoon skiiing with not a huge journey home. Tennis dome at Chis (between the house and Tarbes). Outdoor and excellent indoor clay courts. The nearest 18 hole golf course is just over 15 minutes away, at Tarbes. There are others at Lourdes (35 mins), Bagneres (35 mins) and the oldest course in Europe at Pau (50 mins), apparently founded by two British officers after Waterloo! Outside: You enter through the wooden double gates onto the gravelled parking area. The terrace surrounding is the ideal place to lie and soak up the sun and have a lazy time, and the pool area is enclosed on three sides. Beyond the dining area is a large expanse of green, and various outdoor games are provided - football nets, badminton, boules, a large trampoline...... Indoors Downstairs A large sitting room with comfy couches, tv and dining table. Large room with table tennis table, stereo and more seating. Small sitting room with information brochures. Small, fully equipped kitchen. Downstairs toilet and shower Upstairs 5 bedrooms, including master with en suite. toilet and shower room Table football Cleaning / Towels / Linen / Maid service: Towels and linen are provided, and beds made up on your arrival. The property is cleaned between lets, and fresh linen provided once a week for longer lets. If you have a special celebration, given prior notice, a catered meal can be arranged. We had a great holiday in this lovely property. There were 6 of us, two families and it was more than big enough with 5 bedrooms and lots of living space. The house had lots of character and rustic charm and the pool was heavenly. The whole property was completely enclosed which was great for the children and dog. The garden was huge and the surrounding countryside was beautiful. The village is very quiet and the nearest shop is about a 10 minute drive away but this means that it it is very peaceful and the only sounds to be heard at night are from nature! Perfect holiday had by all. Highly recommend. Thank you, Rebecca! I'm glad you all had a good holiday. Great place, lovely furnishings, huge garden, pool area great suntrap. Property was larger than expected and has everything imaginable to make a family holiday memorable. We will be coming back! Great, large pool area and big garden; comfortable and very spacious bedrooms and living areas. In a small village that is quiet (apart from an occasional dog bark and cockerels from the farms nearby but that only added to the charm). Local shops are walking/cycling distance and there are good restaurants and towns nearby. We all missed this property when we left! Lovely village, in an area full of character at the foothills of the Pyrenees. Great drives, walking and adventuring, though we found it hard to drag ourselves away from the house with so much fun to be had round the pool, and playing games in the grounds and in the house. Basic kitchen and bathrooms, but everything you need, and good value. Would stay again. La Maison Rose is just 90 minutes by car from Biarritz and the Atlantic beach resorts of Capbreton, Hossegor, St Jean de Luz, for surfing and sunning! A 3 hour journey the other way takes you to such Mediterranean resorts as Cap d'Agde. Car is essential to get the best out of the area, taxis are few and far between. Lourdes/Tarbes/Ossun - 25 mins (Ryanair from Stansted) A lot of names for a small airport! It is between Tarbes and Lourdes close to the village of Ossun. Other ports - all ports Calais and south, drive from 8 -12 hours. Bakers in the next village - 5 minutes walk. Tarbes - 15 minutes drive. Madiran, St Mont vineyards and caves - 25 minutes. Bagneres de Bigorre - 35 mins. Argeles Gazost - 1 hour. Cycling. The Tour de France passes through one of the local villages every year on its way to or from the Col de Tourmalet. A good day out to enjoy the festival atmosphere building up to the arrival of the racers (don't blink)! For the more active, La Maison Rose has provided a peaceful starting and finishing point to attempt the Pyrenean stages for themselves. Tennis courts at Chis, 10 minutes drive. Hiking, skiing, white water rafting in the Pyrénées, upward of 50 mins drive. Horse riding - stables abound in the area, and the quality of the horses and the trekking is always high. Stables are within a 10 minute drive, but our favourite is in the hills north of Vic, 25 minutes drive! Grottes (spectacular underground caves, with stalagmites and tites) within 45 minutes drive, Bettheram is wonderful! Aerial tree walks, and other such activities all within 45 minutes drive. Parc Walibi (theme park with scary rides, a smaller Disneyland without the queues) at Agen, with shaded picnic area, just under 2 hours drive. Markets - at least one for every day of the week, including a tiny one on Sunday, also watch out for the night markets, flea markets, and (very high quality) car boot sales. The Gascony area is a gourmands delight, with a wide variety of dishes on offer, and international restaurants in Tarbes. Try the local soup 'Garbure' - delicious! Eat duck in all its forms, local free range veal, seafood platters, a massive range of charcuterie and cheeses. Restaurants range from 11 euros menus - four or five courses plus all the wine you can drink! through middle priced - 30 - 40 euros for two, to high gourmandise. Banks and petrol at Vic en Bigorre (10 minute drive), Orleix for supermarket with hole in wall and good priced petrol (10 minutes). Booking Notes: Contact via email or phone to confirm availability To secure booking, 50% of total to be paid with the remaining 50% due 5 weeks (35 days) before start of rental. Changeover Day: Changeover day is Saturday, although in off peak periods this may be flexible, especially for short or longer lets.